The suffering that we may encounter on pilgrimage is emotional. It is physical. It is spiritual. Since suffering (or sacrifice of some kind) will be present on pilgrimage, just as it is in the pilgrimage of life, how do we cope with whatever we encounter on our pilgrimage? How do we approach those challenges prayerfully and with grace? Packing is a key part of any trip. Pack too lightly and you’ll need to purchase things at your destination or go without. Pack too much and your luggage will quite literally weigh you down! Here are 5 items that you definitely must pack for your WYD Pilgrimage! This is the first in a series of blog posts about Verso Ministries’ upcoming trip to the Holy Land, in May 2020. In today’s post, we chat with Father Ian Van Heusen who will accompany pilgrims on the trip. Prayer is central to the pilgrim’s experience. Here are 5 of our best tips for praying not only during your pilgrimage but also before you depart! I was recently on a pilgrimage to France tracing the roots of the Holy Cross Congregation including the sisters, brothers, and priests. Going to France, especially Paris, has always been a bucket-list pilgrimage for me, so this was a welcome experience. There were, of course, the major sites to see - Notre Dame, Chartres, the Shrine of the Miraculous Medal, as well as many significant cultural sites and great food I was looking forward to experiencing as well. One of my favorite stops was St. Eustache, a magnificently beautiful church that towers over nearby buildings but has no crowds whatsoever compared to the lengthy lines just to get inside Notre Dame. One of the main figures of Holy Cross is Blessed Basil Moreau, who was responsible for founding the three branches of Holy Cross. Much of his life was spent in northwest France including much time in Le Mans, where his tomb and shrine are located at Holy Cross Church. On one of the early days of the pilgrimage we gathered around his tomb to celebrate Mass together. The Mass was bi-lingual in French and in English, but in reality went far beyond that. You see, Moreau was passionate about education and a missionary spirit of spreading the Gospel message to the world. Today, Holy Cross is very much a reflection of that, especially in our pilgrimage group. Bangladesh, Brazil, Vietnam, Canada, Haiti, Peru, Chile, Burkina Faso, Uganda, Kenya, India, Ghana, and the United States were all represented through pilgrims' homes or where they've been sent in their vocation. In that Mass at Moreau's tomb we were one Church, one family in Christ. This pilgrimage was more than what I imagined. It was more than just a chance to see Paris and the sites of Blessed Basil Moreau's life. This was an encounter with the Church Universal, truly Catholic and catholic. There was a beautiful panoply of backgrounds, languages, customs woven together as the group progressed through the pilgrimage. 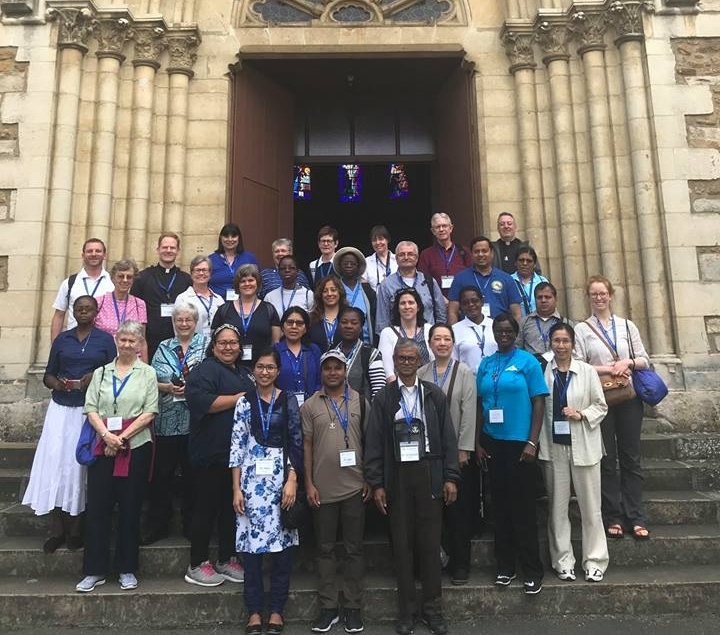 Something about this collection of people from around the world and of varied backgrounds made the life and vision of Moreau more vivid as we pilgrims - a living witness to his mission - stepped out on a pilgrimage to find an encounter not just with the sacred past, but the living present of the worldwide Catholic Church. Did you know that the first international World Youth Day gathering was in Argentina in 1987 but the roots go back to Palm Sunday 1984 in Rome? Saint Pope John Paul II declared the liturgical year of 1984 to be a great Year of Redemption. Part of this year was an invitation to young people to come and celebrate with him. Expecting about 50,000 youth and young adults, Vatican officials were astounded to welcome over 250,000 young people to the city. Then in 1985 the United Nations declared an International Year for Youth. John Paul II kept stride with the UN and again invited the young to come and bear witness to the faith with him on Palm Sunday. They did not disappoint him and over 300,000 descended upon Rome. In 1986 the Pope challenged diocese around the world to hold their own World Youth Day celebrations. Then in 1987 the first international gathering was held in Buenos Ares, Argentina as a message to the country as it emerged from dictatorship. This coming January, Pope Francis continues the tradition of World Youth Day and invites the young people of the world to come encounter their faith and each other as we celebrate our national identities as well as the Church who makes us one! This truly historic event will bring World Youth Day back to Latin America for the fist time since 1987, coming with a Latin American Pope to the first diocese of the New World. If you are interested in going or know someone who you would like to send please contact us. There is still time! There is much beauty, goodness, and truth that a pilgrimage like this can show us as John Paul II reminds us, “The response is given by all of you who have been coming to Rome on pilgrimage for many years precisely to celebrate this day... Does this not mean perhaps that you yourselves are searching for Christ at the heart of his mystery? You are seeking it in the fullness of the truth which is Christ himself in the history of humankind” (Homily, 27 March 1988, Palm Sunday Mass, 3rd World Youth Day). 5 things you should pack for a pilgrimage that you probably didn’t think about. Hear about Shoaib’s journey of faith that brought him to seek Christ in the Holy Land.